You asked for it now we've got it. 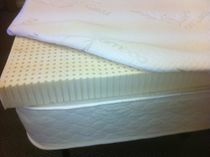 Our top of the line all natural talalay latex mattresses toppers are now available in all sizes. 3 inches thick and available with an optional bamboo zippered cover. As usual we offer the lowest prices on the internet with fast shipping to your doorstep via UPS.